If you have allergies, you understand the discomfort that comes with them. You most certainly don’t want to be uncomfortable in your own home. Ensuring your indoor air quality is at it’s best can take some work. Cleaning is an important part of reducing the allergens in your home, but doing so can sometimes stir up dust and dander, which only aggravates your allergies. Here are seven cleaning tips to help you reduce allergic reactions. Using a broom to do quick touch ups might seem like a good idea, but they will only stir up more dust in your home making indoor air quality even worse. Lugging out your vacuum cleaner at least twice a week is a good way to ensure that your floors are as allergen free as possible. You can also try using a small particle filter, which will ensure even the tiniest of allergens are caught. Your sheets can be covered in pet dander, pollen, dust mites, and other allergens that you may have brought to bed with you. Be sure to wash your sheets at least once per week using a gentle detergent. You may even want to vacuum your duvet or quilt on a regular basis to eliminate allergens there as well. The bathroom is the easiest place for mold to grow in your home. The moisture that is produced each time you shower can lead to mold growth if things are not cleaned and dried on a regular basis. Make sure you wipe down your bathroom walls and floors after showering. You may also want to leave your bathroom door open after a shower to ensure that the moisture is able to dry properly. One of the easiest ways to reduce allergens in your home is by dusting on a regular basis with a microfiber cloth. Microfiber cloths will gather every small particle and ensure nothing is left behind. Other dusters can spread dust all over the place and cause allergic reactions. 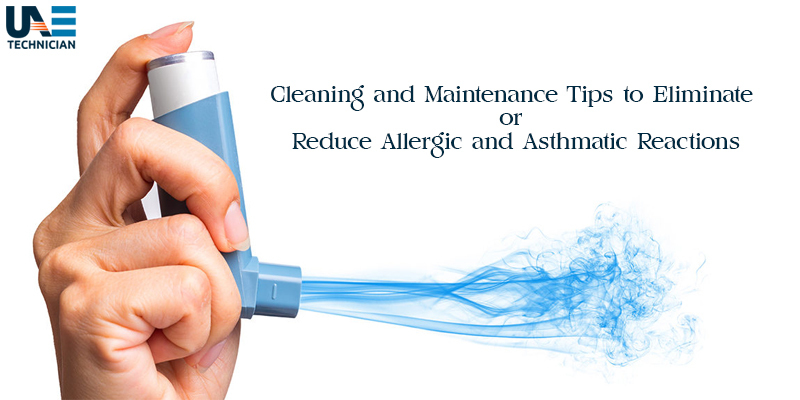 Air conditioners can really aggravate your allergies if they are not cleaned on a regular basis. Allergens can get trapped in the filters of your AC unit and will be released into the air each time you turn it on. Be sure to clean your filters on a weekly basis and replace the filters altogether on a regular basis as well. You may not really think about cleaning these items very often, but it’s important if you want to reduce the allergens in your home. Use your vacuum cleaner’s attachment wand to clean your curtains and blinds at least once per month. You’ll want to ensure you also wipe down blinds with a microfiber cloth regularly or throw your curtains in the washer if you are able. As an allergy sufferer, you’ll have to clean your home more often than the typical person to ensure your home isn’t the source of your symptoms. This means you should not clean their entire home all in one day. It’s important to spread out the cleaning tasks listed above throughout the week so you don’t need to do a ton of cleaning all in one day. Keep your allergy symptoms at bay by following these cleaning and home maintenance tips throughout the week. They will ensure your indoor air quality is improved and your home stays as clean as possible.